This weeks fabulous offer The Bin Bots Bag; A fabulous three peice Bin Weevils Themed Party Bag containing a Bin Bots blind Bag and Trading Cards with exclusive on-line code! At £3.10 each Bin Bots Bin Weevils party bag is already great value but with another 20% discount applied at check out on this item its unbeatable value packed with Bin Weevils Goodies guratnteeing that all Bin Weevil fans will leave the party with a huge grin on the faces! The Bin Bots Bag contains a genuine Bin Weevil Bin Bots Blind Bag, each Bin Bots blind bag contains a random Bin Weevils Bin Bot, with bronze, silver and gold bin bots to find, if you are lucky enough to find one these rare Bin Bots you get the added bonus of extra mulch! Any Bin Weevils fan will be able to explain this to us older fuddy duddies! You also get a pack of Bin Weevils Trading cards, there are loads of cards to collect in cluding some rarer foil and glitter cards, in every pack there is also an exclusive secret on-line code, you could find your self with extra DOSH! 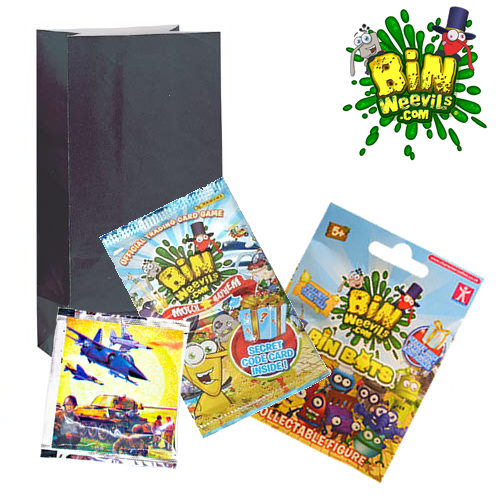 The Bin Weevils Bin Bots Bag is finished off nicely with our mischief party exploding bag! Pop the tab inside the bag, drop the bag on the floor and watch as it fills with air until it explodes with a loud bang! All supplied with a Black Paper Party Bag for you to customise or use as it is. Add the obligatory sweets and cake and this really is a knock out of a party bag for your birthday child and their guests!